Organic and printed electronics have become established in many important industry sectors. 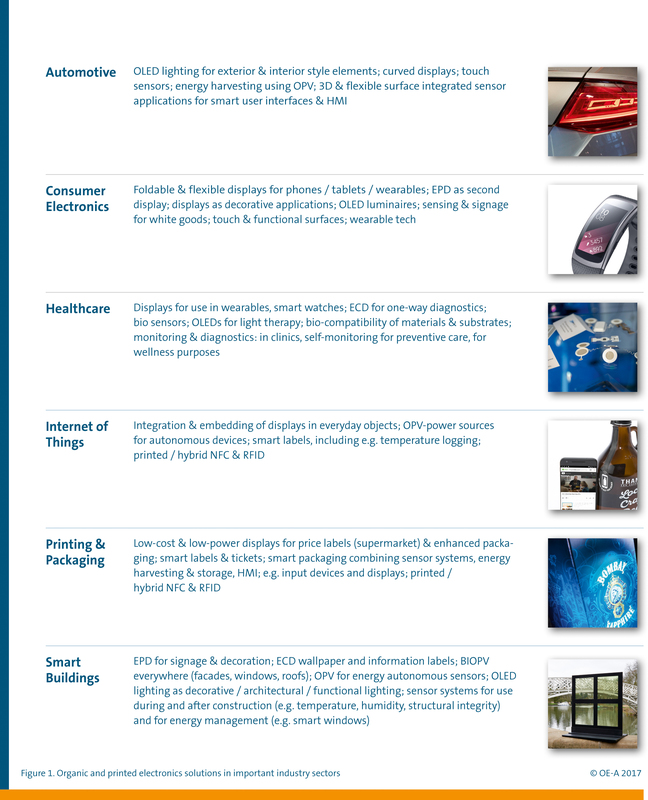 From the Internet of Things, consumer electronics and healthcare to automotive, smart packaging and buildings – printed electronics is now used in numerous products and industries worldwide. This is one of the central results of the seventh edition of the Roadmap published by the OE-A (Organic and Printed Electronics Association), a working group within VDMA, on display at LOPEC 2017. "Major industries, including automotive and consumer electronics, have come to embrace organic and printed electronics by integrating this technology in their products. It is clear that OLED displays and lighting are still the driving force for this technology. The new OE-A Roadmap reflects this development by including important industry sectors and by explaining how printed electronics enhances their products,” said Dr. Wolfgang Clemens, Spokesperson of OE-A Roadmap and Head of Product Management PolyTC at PolyIC. “Of course, we also examine the progress made in individual application clusters ranging from OLED Lighting, OPV, OLED and Flexible Displays, to electronics & components and integrated smart systems – and not to forget the development in materials and processes,” he added. These positive findings are also reflected in the key parameters reliability, capital expenditure, cost, environmental impact, and standards. By now, there is hardly any differentiation between application and technology parameters anymore, which underlines the increasing maturity of the printed electronics industry. The OE-A’s experts expect continued strong growth in the coming years, triggered by new and improved materials, equipment, processes and device design. However, there are also some areas where technological barriers, also referred to as 'Red Brick Walls', need to be overcome. These are also identified in the Roadmap, including to point out areas where additional development is needed. A summary of the seventh edition of the OE-A Roadmap for Organic and Printed Electronics is included in the new OE-A Brochure, which is available at the OE-A booth 510 (Hall B0) at LOPEC 2017 as well as on the OE-A website. White Paper: OE-A Roadmap for Organic and Printed Electronics will be published in June 2017, containing more details about the applications and technologies.